or enrolling in Summer School! Classes for Beginners $175 5 - 8 yrs (one morning class/day) Youth $300 nine & up (2 groups/day; ride 2X/day) and Adults $225 (one evening class/day) Beginners, who want to ride for an hour, start at 9 a.m. and are welcome to come just for their class and then leave. Riders in the other sessions will have one practical class in the morning and another fun class after lunch. These riders need to bring a bag lunch and plenty to drink. 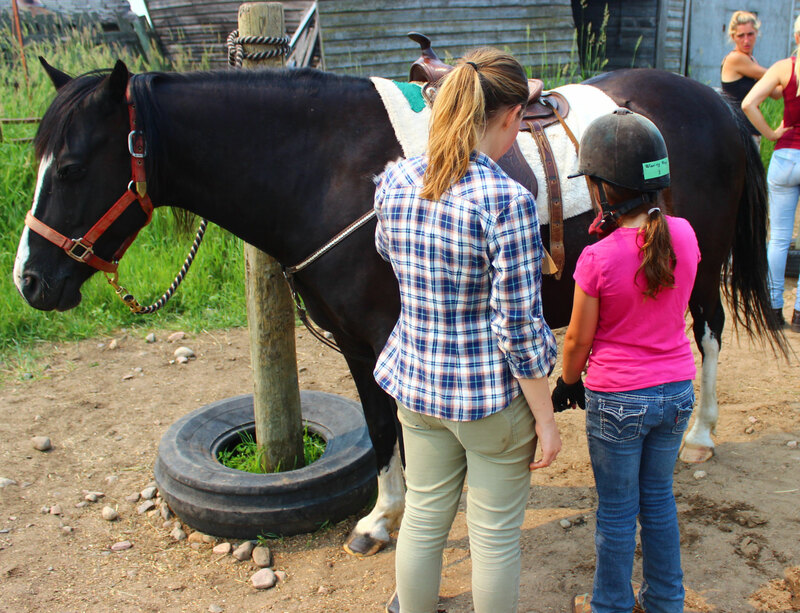 Just Startin' is for those who have minimal riding experience—these sessions provide an opportunity to interact with horses and ride (with a Helper for younger children to ensure safety). 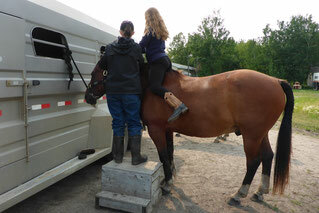 The Rookie class is for riders who have had previous riding lessons or equivalent. We have a Just Startin’ Riding class in the evening (7-8:30 p.m.) for adults who would like to learn more about horses and ride. This camp will have two instructors and will be broken into two 3-day intense learning session. The first 3 days will be English Riding--Dressage, Hunter & Jumper; second 3 days Western Riding--cattle work, obstacles, trail riding. 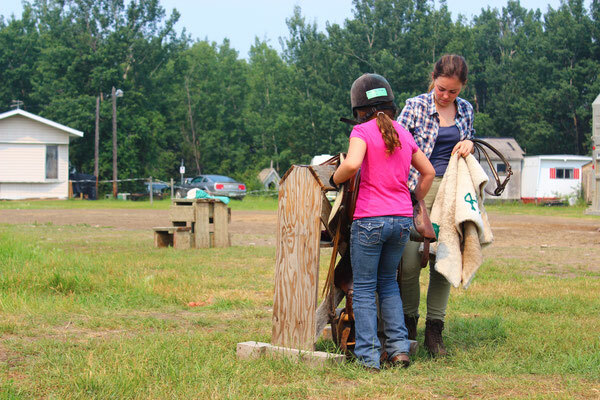 Classes for Rookies, who have had previous riding lessons or equivalent, will stress improving the rider's balance and confidence on a horse. Novice & Intermediate riders will prepare their horses on their own (may use their own horse if suitable) and ride English July 23, 24, 25 and Western July 26, 27, 28 to improve horsemanship skills, gain confidence and build a larger skill set. R, N & I classes $500/6 days will ride 2X/day; $270/3 days. Riding should be fun... so Hunter courses, cow work, learning how to braid, games, hunts and Trail challenges will be held in the afternoons. The 2 hour evening class for Adults $375/6 days; $200/3 days will have theoretical as well as practical aspects. This class can be tailored to the participants requirements: choose from either discipline and different levels of proficiency. Participants will choose between lesson and trail ride for Saturday evening. For those who really want to trail ride! 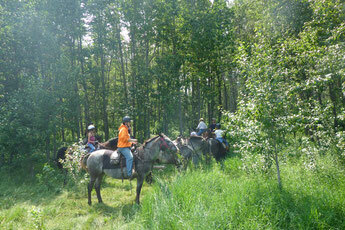 Experience several days of Adventurous Trail Riding. Prefer riders confident at lope so group can cover more miles. Will gladly put "trot only" riders on a wait-list for another weekend of Trail Riding Adventures. Mandatory safety and orientation class on Aug 3, Friday evening. Ride all 3 days Aug 4, 5, 6 OR choose the day that suits you best. Use a Winning Ways horse $125/theory & 1 day; $100/additional day OR use your own horse $75/theory & 1 day; $50/additional day. You and your horse must be fit and accustomed to the warm temperatures. These 5 day schools are designed for the particular students involved and can be for families or youth groups. There are several options to choose from: Child Beginners (5-8 years, Adult to remain with child) 1 hour/day for 5 days; $180/rider, require 3 beginners/session. The format for youth or rookie riders is either a 2 hour/day or a 3 hour/day school; participants choose either mornings or afternoons. The Grass Green school is 2 hour (Half hour Horsemanship + 1.5 hour prep & ride/day) $300/rider (4 riders max. ), games and obstacles are included in these sessions. The White Clover school is 3 hour (One hour Horsemanship + 2 hour prep & ride/day) $425/rider (suggested for youth 10 & over and adults looking to trail ride, 5 riders max. 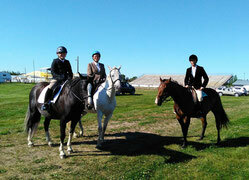 ); the White Clover school group could choose to go on a one hour trail ride the last day of the school. Riders in lessons must be a minimum of 5 years old. Trail riders minimum age 8 years. Prices are based on a minimum of 3 students/lesson. Individual lessons are available but priced accordingly. Discounts available for families, youth groups and clubs.